It's difficult to get the images of that airplane in the Hudson River with the crew and passengers neatly lined up on both wings, out of your mind. The enormity of that miraculous landing on January 15, 2009, to most of us, is unfathomable. Unless you read Captain Chesley "Sully" Sullenberger's account of what happened that day. As passengers, we listen for knocks and feel the bumps, and some even white-knuckle their flights, but in reality, we don't have a clue as to what it takes to fly a plane, especially an enormous Airbus A320 with 155 people on board. Capt. 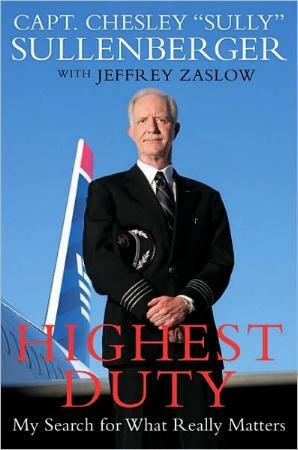 Sully's story starts with his enthusiasm for flying as a young boy and his earning his pilot's license at sixteen. Responsible pilots take their profession very seriously. They have to as they're in charge of hundreds of people up 30,000 feet in the air, and even more so in light of the terror attempts these days. Not only is this heroic pilot and captain a revered man, he's also a devoted family man. Humbly, Capt. Sully says his reaction to the birds flying into his plane's engines was a result of all his years flying and listening and learning from instructors and others. In other words, he paid attention along the way. He relates his life in relation to his family and career in the military (he attended the US Air Force Academy in Colorado Springs, CO) and it makes for an interesting and eye-opening read. Not only is he a pilot, he's also heavily involved in safety issues in their entirety, has raised seeing-eye dogs, strives to be healthy, and is a concerned citizen. I shed more than a few tears and sobs and just loved his message. Conclusion - An incredibly moving and uplifting story of one good human being.